Thank you, Jesus, for that particular unanswered prayer. I have always admired well-done tattoos. I just never fell in love with anything to the point of wanting it permanently etched in my skin. In the months leading up to my thirty-fourth birthday I grew more and more convinced my desire for a tattoo was not a passing phase. For a girl who bucked the trend of “tramp-stamps”(no judgement, just invoking that particular turn of phrase for flair) and Chinese letters, unlike the vast majority of my contemporaries in the early 2000s, it was a bit of a shock to my husband and friends when I announced I was getting a tattoo. I understand many people have tattoos which have meaning, and many folks have tattoos that don’t mean much beyond I like to get tattooed. I don’t think one is better than the other, or one is right and the other wrong. I believe your body is your own, and part of the beauty of having a body that is uniquely your own is being able to live in it however you see fit. Which brings me to my own tattoo. Like most of the decisions in my life, getting a tattoo wasn’t just about getting a tattoo. It was about something much more for me. In my adult life, I’ve spent an astonishing quantity of time and energy trying to change my body in one way or another. Faster, stronger, leaner, thinner, more feminine…less this, more that…there is always something. As I’ve approached my mid-thirties, I’ve come to a place where I’ve decided I’m tired. Tired of being distracted by what life will be like when I’m _________ (fill in the blank). I just want to be here, now, with whomever happens to be with me…including whatever version of myself happens to be here NOW. Don’t read that as my condemnation of change or improvement etc. I’m all for change, adventure, development, and evolution. I’m just no longer willing to spend my time and energy on the faulty belief that life, that I, will be better or more worthy if I reach some set achievement or goal oriented around my physical appearance or performance. Life is already great. I am already worthy. I just require the proper perspective to see it. For me, permanently inking my skin was a commitment to both the idea that my body is worthy of being considered an appropriate canvas for a work of art—that my body is a work of art, and that worrying about what it will look like when I’m older, fatter, thinner, etc. is a waste. It will be what it will be, and I will love it. So, I asked a bestie to help me bring to life the idea I had swirling in my head. We created a design, and I started researching tattoo artists. I talked to other people who had tattoos that I liked, and I checked artist portfolios online. Much to my surprise and delight, I was drawn to a tattooist in my hometown even after researching out of state. I made an appointment to meet her, and when I walked into her shop, I knew from the first moment that she was who I wanted to do my tattoo. We talked about what I wanted. I showed her the computer sketches I had, and suggested I’d like her to add her own artistic touch. She agreed to do the work. Like most of the really good artists, she was several months out. I made an appointment for three months later…the day before my thirty-fourth birthday. 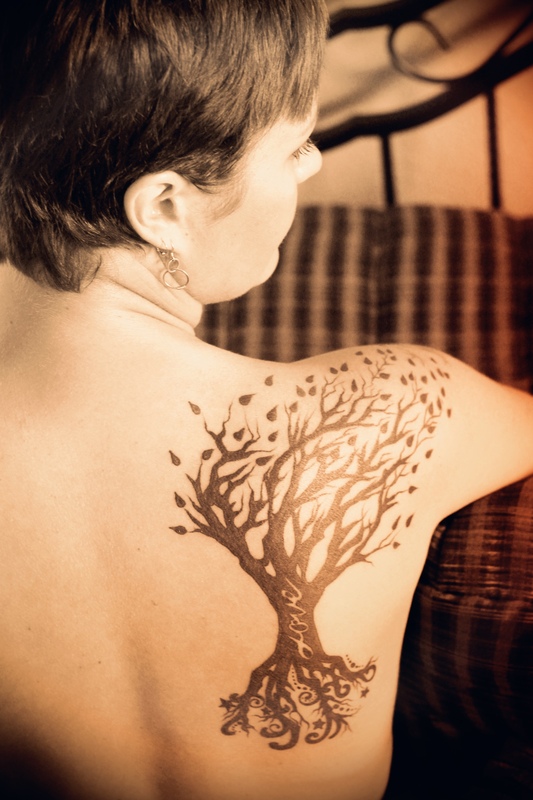 The end result was a reminder literally etched in my skin, created to bring to mind my desire for my children—that I give them roots and wings. My affinity for the symbolism of a strong wind—the power of things which we cannot see and the potential of those things to bring change and challenge. My belief that God is love—to be grateful I have been fortunate enough to receive abundant love and to remember love is the pillar I choose to use as an anchor for my life. And my need to remember the roots that ground me—what is found below the surface is resilient and determined, strong and undeniably beautiful. Perhaps one day I will see my shoulder, it’s faded ink, age spots and wrinkled skin, and wonder what it might look like without the tattoo. I’m not worried about that. If I’m lucky enough to have lived long enough to see it fade and wrinkle and reflect on the years in between, full of whatever this life has in store for me, well then, I will have been lucky enough. I would like to recognize Leila Wilcox, the artist that ultimately created and inked this tattoo for me. I can’t thank her enough for sharing her gift with me. You can find Leila at: 2335 12th Street in Casper or on Facebook at Sweet Misery ElectricTattoo.